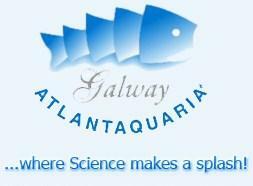 Galway Atlantaquaria (The Promenade, Salthill) in partnership with Discover Science and Engineering and the Marine Institute will host a Family Funday to celebrate the launch of Science Week on Sunday the 10th November. Running from 11am to 5pm the event is aimed at people of all ages. Key features on the day will include the “Exploration Dome” which will offer young and old alike a journey through the oceans, stars and space. Dale Treadwell and the Mad Scientist will be present, each bringing alive their own particular brand of science. Explore wildlife with Dale and discover the science behind Energy with the Mad Scientist. There will be lots of fun activities for children to get involved in. They can roll up their sleeves and get involved in some interactive science experiments as well as trying out our arts & crafts area. Jumping Clay will also be there with their unique brand of mouldable clay, while face painting will appeal to even the youngest children. A must visit show for all baking enthusiasts brought to you by Goodness Cakes in association with ACT for Meningitis, combining all the latest ideas, supplies, live demonstrations, competitions for professionals & novice bakers, finalist of school & corporate bake off competition. There’s no need to use too many words to explain this beautiful project (that we can enjoy within the Fringe Festival) especially after checking the images and pictures they are publishing. 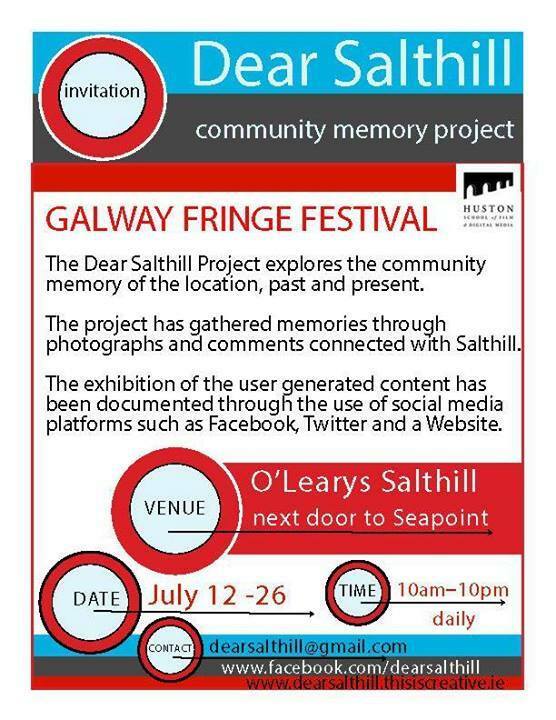 Dear Salthill is a community memory project established in March 2013. The project aims to gather fragments of memory attached to Salthill.The focus of the project is collective memory of the location. It explores the collective community memory of the location, past and present. The process is being documented through the use of social media platforms such as Facebook, Twitter and Instagram. 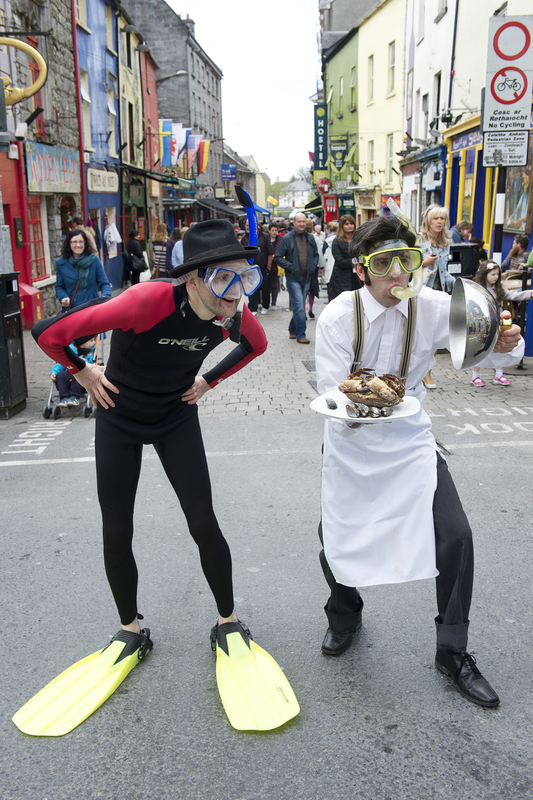 Here’s our selection of activities related to the Galway Sea Festival. It did started last Sunday, 26th of May but this weekend is when they are offering most of the plans. *** Friday to Monday at 10, 13:30, 16:30 and 19 h you can try Sea Kayak. 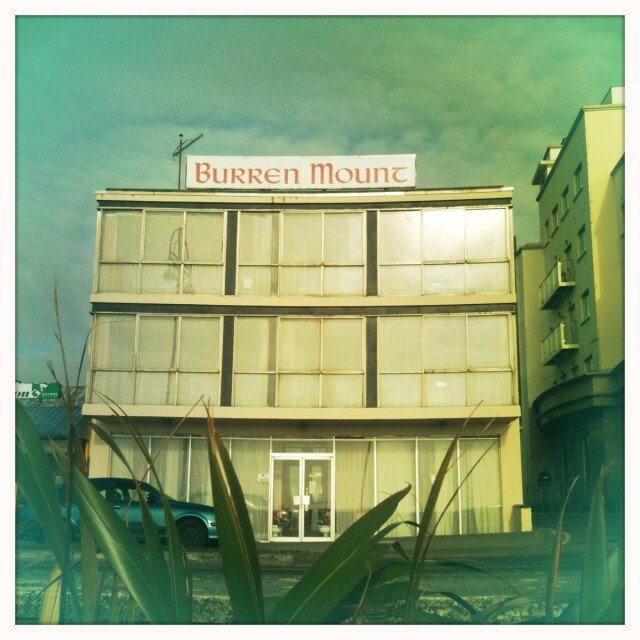 In Palmers rock, Salthill (opposite Leisureland). 90 minutes sessions for 20 euros (15 euros if you are under 18) with the staff of Give it a go. Display Jump (skydive) in South Park at 14 h.
Traditional boats on the water in the Claddagh Basin from 10 30 to 12 30 h.
As usual, the program is quite long, and these are only a few of the activities for the weekend. This Sunday, we can go to Grattan Beach, Salthill for an activity to explore the wildlife of the shore, we are going to check what is in the sand, under the rocks and in the rock pools. With the support of the GMIT, the Ryan Institute (NUIG), the Irish Wildlife Trust and Galway Atlantaquaria (among others) we can learn about the eco-system around us. Next June bank holiday weekend we will be enjoying the Sea Festival, and this can be its first activity. It is a free event and everybody is welcome to learn about the real situation of the sea and the Galway coast. From 11 30 to 13 30 experts like Dr Nóirín Burke, Education and Outreach Officer at Galway Atlantaquaria, will be on hand to offer guidance and to help identiify the plants and animals. Also the Safari is looking for the different litter we can find on the beach. During the 2 hours a beach clean will take place to remove larger items of debris and looking in the sand and on the strand-line for tiny pieces of plastics, for the Beach Plastic Investigation. 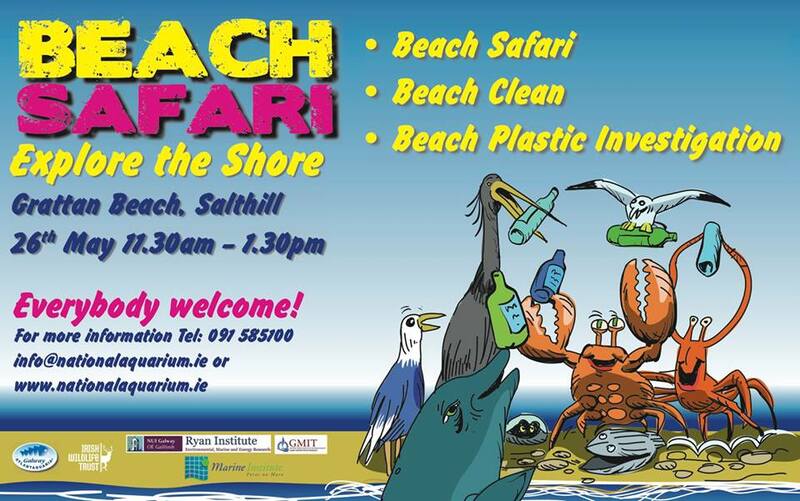 The Beach Safari is a free event and begins at the lifeguards’ hut at Grattan Beach, Salthill at 11.30am on Sunday 26 May. No equipment is needed except buckets and nets. 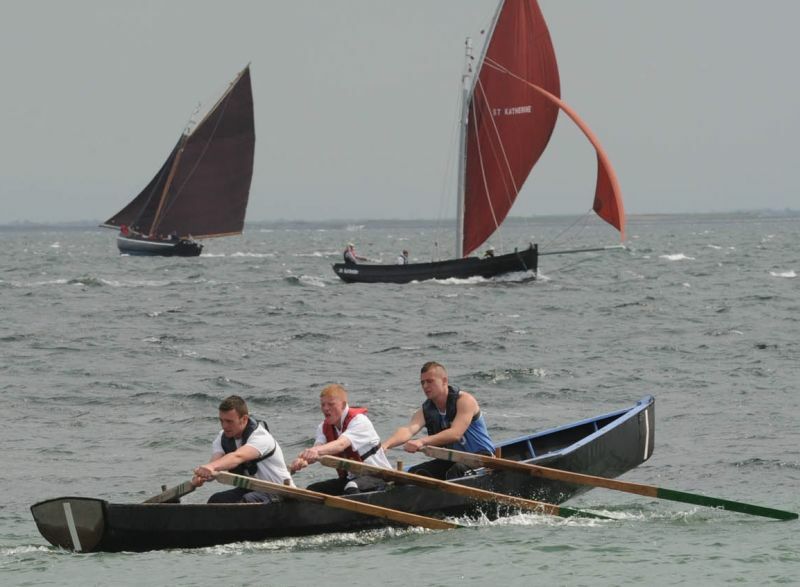 This Sunday, May 5, in Salthill, with a more or less sunny weather, we will see the third year of this festival (since its return) with the All-Ireland Currach racing as the main event. 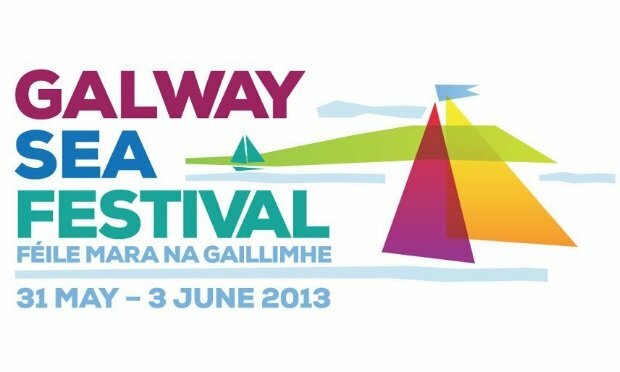 It’s a one day festival, starting at midday on the beach in Salthill, most activities taking part on Ladies beach and Galway Bay Hotel. An Tostal is a concept to show some aspects of the irish life and started in the 1950’s. 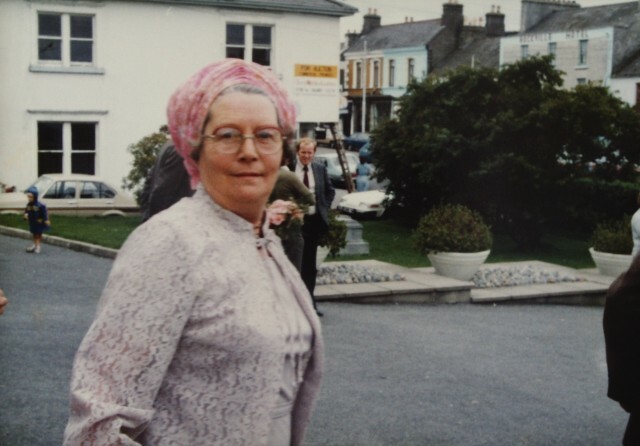 It was first an excuse to get more tourists, especially American, and every town and village was encouraged to form An Tóstal committees and devise a programme of events during the last two weeks of April using the theme “Ireland at Home”. As a celebration of Irish tradition, this Sunday we can see Irish dancing between the races (from 1 30 pm) and the Tug O’War game (rope pulling) from 2 30 pm. Music and fun after the races in the Galway Bay Hotel. There’s also a sand castle competition, on Ladies Beach, for children from 4 years old accompanied by an adult and a parade of Galway Hookers at 2-3 pm. Don’t forget your sun glasses (and the umbrella) and your camera!